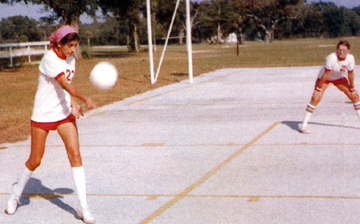 A photo of girls playing vollyball from the 1977 yearbook. Can anyone identify the players? The "notorious" Alan Forget (Class of '79) responds: Talk about bringing back fond memories! I've got quite a few pictures left over from those days as I was one of the Yearbook's student photographer. In fact at least 2 of the pictures that you have displayed in the "more pictures" section of the website were taken by me. One picture, of the 2 girls playing volleyball was taken by me. I can't remember the girl's name in the foreground, but the girl in the background watching is Jill Treadway.